I had a midterm the day after Halloween this year, so didn't have high expectations of being able to do much in the way of celebrating. Gareth decided to be Harry Potter over the summer, so that was easy. And Mal discovered an astronaut costume at preschool and from then on was excited to get his own astronaut costume, so that was easy as well because Melissa and Doug happen to sell a rather cute astronaut costume. 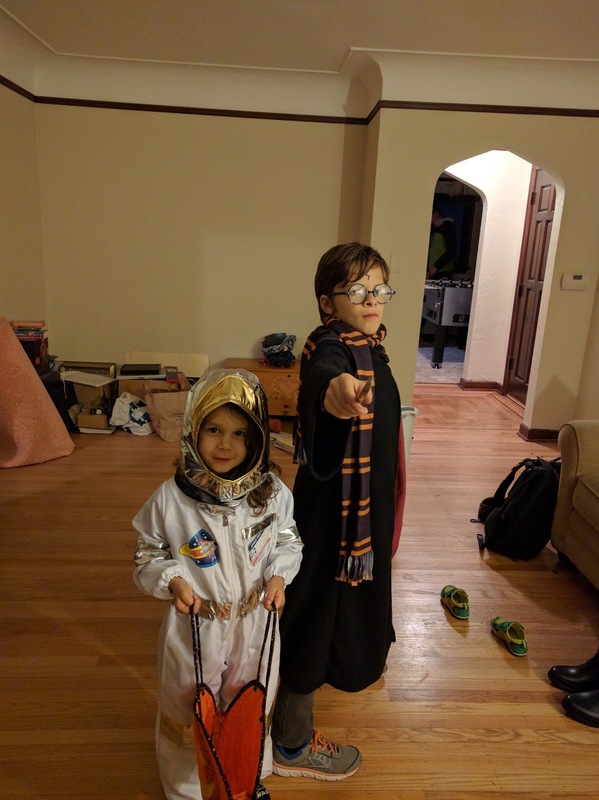 I found an etsy seller for wands, and Gareth was set. Ryan took the boys out while I studied and handed out candy. We got a decent number of trick-or-treaters, despite the weather. Fewer of the youngest crowds, more of the older crowd. All the kids were very polite - wishing me a Happy Halloween, complimenting our pumpkin, saying thank you, etc. The boys didn't stay out super long because it was a rainy day, but they got plenty of candy and were content with the couple blocks they did. 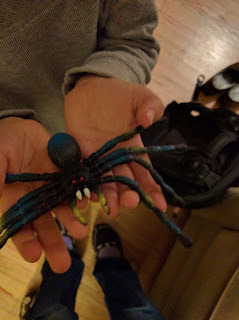 Mal was very excited that he got a toy spider at one house. The boys worked together to design our pumpkin this year. Mal had seen pictures of our pumpkins from 5 years before and wanted the teeth to look like Gareth's pumpkin from that year. Gareth got to design the eyes and the nose. I made the boys do most of the cleaning out of the pumpkin and Gareth carved the eyes and nose himself. Next year we'll have him do his own pumpkin. 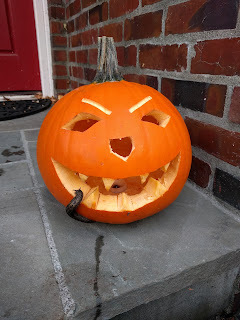 I came home a couple days after Halloween and saw an enormous slug on the pumpkin - so large that it startled me. I've never seen such a long slug before, and hope to never again. It was a good Halloween. Mal got to enjoy the neighbor's skeleton decorations again, and was sad when they got put away. But now he's excited for Christmas, so he's got something else to look forward to. The slug is PERFECT for a creepy Halloween thing, don't you think? Crawling into the mouth of the jack o'lantern! Doing its part to add to the creepy.